No, I’m not being over-dramatic. It is time to buckle the heck up. The resonant disconnect between reality and the pumping that is going on in the media and among supposed “experts” is at an all time historic, never been here before, Economic Mass Psychosis, HIGH. To Quote John Kenneth Galbraith, “The majority is always wrong.” Right now the majority believe we are exiting the crisis. They are just plain old fashioned WRONG – again. 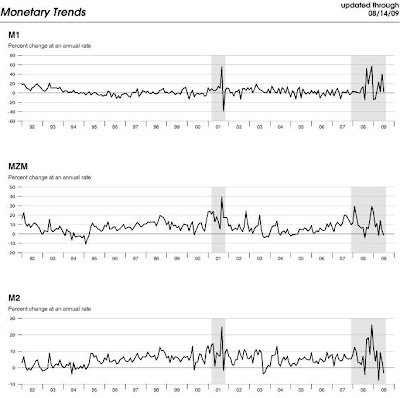 To prove my point, I’m going to show you the week in charts courtesy of the St. Louis Fed. This week, however, I’m issuing a WARNING. 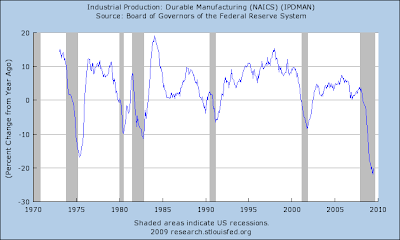 The evidence in these charts points to the beginning of a DEFLATIONARY SPIRAL. The PPI data comes out next week and will be a key piece of evidence in this regard. 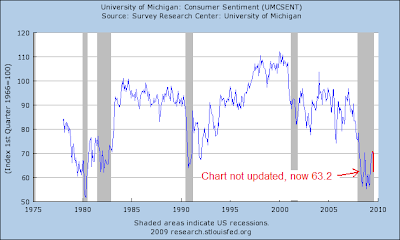 The results of a deflationary spiral will be UGLY if entered. You will see another round of deleveraging to go with locked credit markets. Equities will get hammered and the real cleansing of the economy will accelerate. This process will be PAINFUL but necessary to end the malinvestment. It will be the phase where more businesses who were hanging on HOPING for recovery will simply run out of cashflow to maintain operations. The same thing is necessary to cleanse a way over-bloated government and military. The fallout will affect everyone. 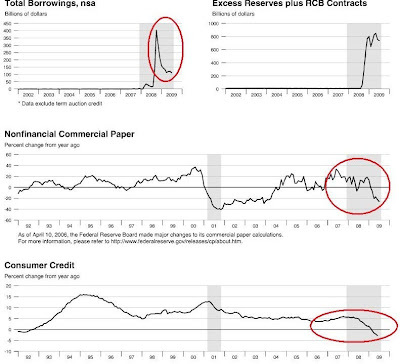 These charts are HISTORIC, they are NOT indicative of a short recession. 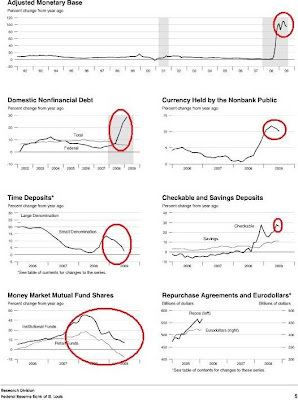 As you view these charts, pay attention to the negative trends and look at them from a historic perspective. 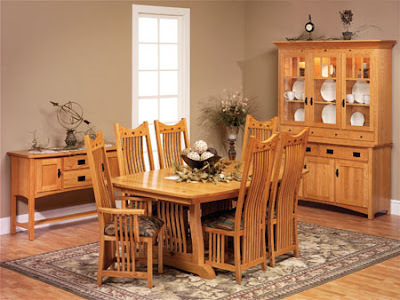 Many market callers are looking for immediate inflation due to the money pumping. I challenge them to point out inflation anywhere in these charts besides the money aggregates, which, by the way, are not growing at the rate they were. Those who look solely at the money aggregates are not seeing the destruction of credit which is very real and has hobbled the consumer. 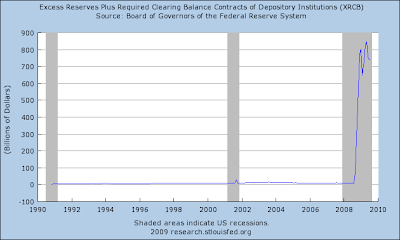 Never ending growth was a fantasy and is over for the time being, there is simply too much debt/credit in the system. The pundits of green shoots will say that the economy is getting better and that the leading indicators are pointing to a dramatic recovery. THEY ARE WRONG. They were wrong in 2007 and they are wrong now. The one and only TRUE LEADING ECONOMIC INDICATOR in a debt riddled society is DEBT to INCOME. That ratio has not improved, it is worse than ever, especially at the governmental level. Since I am talking about inflation and deflation, I think it’s important to reiterate that most people think of inflation as an increase in PRICES and Deflation as a decrease in PRICES. 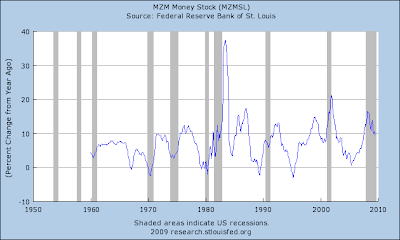 True inflation or deflation is the increase or decrease in the money AND CREDIT SUPPLY. 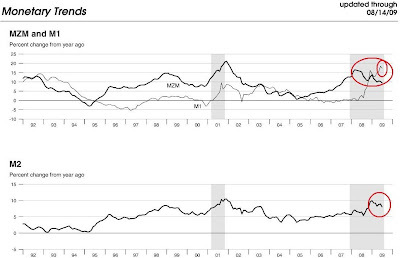 Prices follow but do give an indirect indication of money/credit supply over time when looked at in AGGREGATE. What has fooled so many in the current economy is BAD DATA REPORTING and a SHADOW CREDIT SYSTEM that produced UNREGULATED AND UNTRACKED out-of-control credit (DEBT). To create more growth, the COMBINED credit and money aggregates, whether they are tracked or not, must increase in total. That is not happening, and that is why you see negative growth. FORGET ABOUT GOVERNMENT GROWTH FIGURES, they are so far from reality as to be laughable – they are NOT credible. 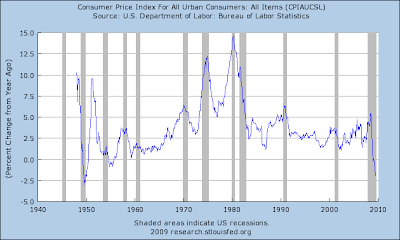 The same can be said for inflation statistics, but they are pointing to a trend and they are not positive. And how are PRICES behaving? 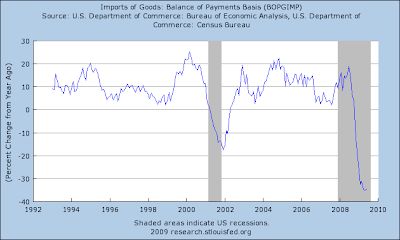 Below is a chart showing BOTH import and export PRICES. The fed does not produce this particular chart, it comes from Econoday. This is a HISTORIC collapse of prices, IMPORT PRICES (watch the scale on the left versus the right) are DOWN 19.3% year over year (yoy)! Think about that, it is HISTORIC. Import prices down nearly 20% in just one year?!! The trend is not turning, it is accelerating downward again. 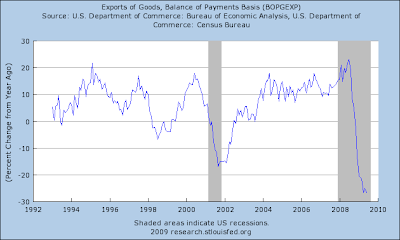 Export prices are down dramatically too, but pale in comparison. At the beginning of this crisis many “experts” said that demand would continue to increase from overseas and that would help offset a slowdown in the U.S., remember? How did that work out? Now let’s turn our attention back inside the U.S.. 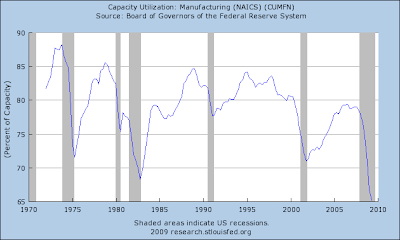 Here is a chart of inventories expressed in yoy percent change. 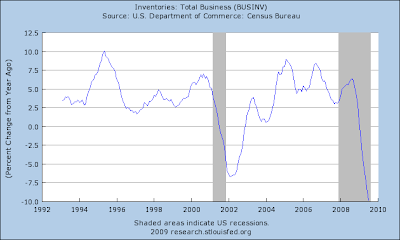 Falling business inventories are actually a good thing as businesses are reacting to falling demand. 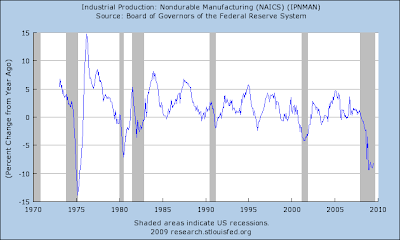 Take a look, though, at when this recession actually began versus when inventories began to fall and compare it to the last recession. Is the contraction over? Would you bet on it? 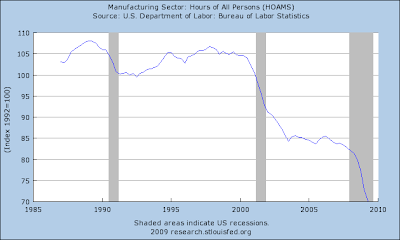 Now let’s turn our attention to what remains of the manufacturing sector. Remember that employment in that sector of our economy is now the same size as it was in 1947 and, quite unfortunately, is a much smaller percentage of the economy (for a complete update on employment, please see Employment Situation in Chart Form – Damn, I knew I should have moved to New York and found a job on Wall Street!). Okay, so that’s what’s happening in the REAL world of sales, export, imports, and manufacturing. 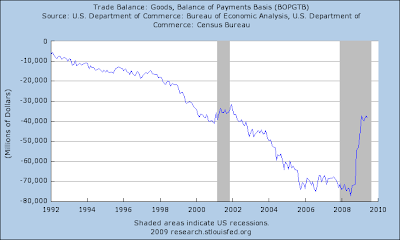 What’s going on in the supply of money and credit? Well, now that we pay banks for “reserves” (and lend real dollars against worthless toxic assets), bank “excess reserves” (Nate says no such thing in reality) are sky high and up nearly 8,000% on a year over year basis! Last week we saw that consumer credit is actually negative. Credit is MUCH LARGER than REAL MONEY. Yes, those aggregates measure credit that’s been deposited into financial institutions, but they do not measure credit derivatives that allow the banks to leverage debt to the hilt. 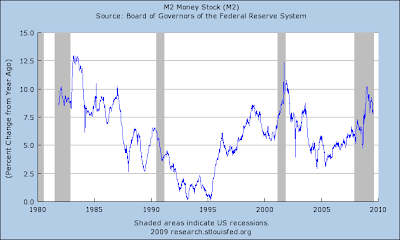 On page 5 we find that the adjusted monetary base has been forced sky high, but the recent trend up has stopped. You will also then see FEDERAL GOVERNMENT DEBT has absolutely skyrocketed, and that currency and time deposits are slowing their rates of growth, and that retail money market shares are negative. 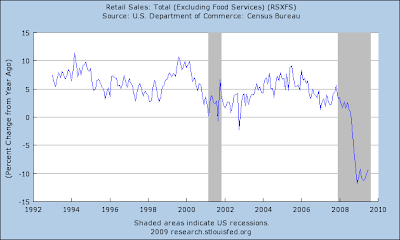 That’s a pretty clear picture to me, one of DEFLATION at work. 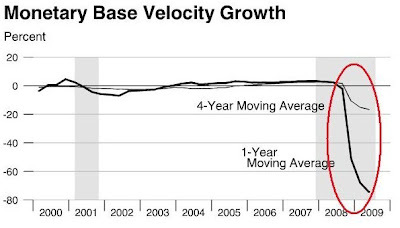 It is accelerating, not decelerating. That is a HUGE divergence from what’s occurring in the equity markets and from what you hear on television from the supposed experts.